New Delhi, February 11: Andhra Pradesh Chief Minister N Chandrababu Naidu’s daylong fast demanding special status for his state on Monday became a rallying point for various Opposition leaders who visited the protest venue to back him and attack the Central government. 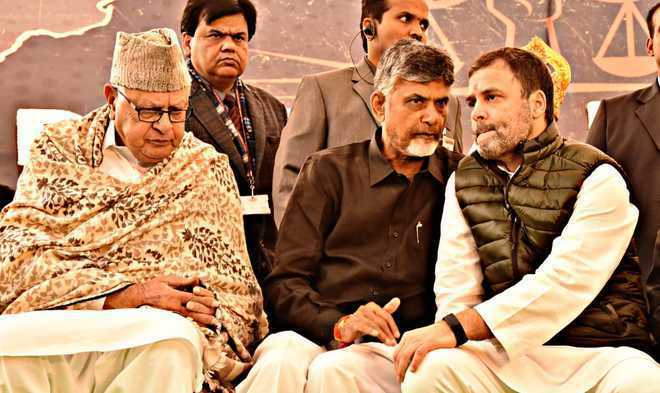 Rahul Gandhi, Farooq Abdullah and Chandrababu Naidu during ‘Dharma Porata Deeksha’ in New Delhi on Monday. Naidu’s ‘Dharma Porata Deeksha’ (a day-long protest for justice), which began at 8 am, is likely to end at around 8 pm. He will also submit a memorandum to President Ram Nath Kovind on February 12. Naidu paid tributes to Mahatma Gandhi at the Raj Ghat and also to the Ambedkar statue at the Andhra Pradesh Bhavan before sitting on the hunger strike.